Asteroid 1998 QE2: Moon discovered using radar. 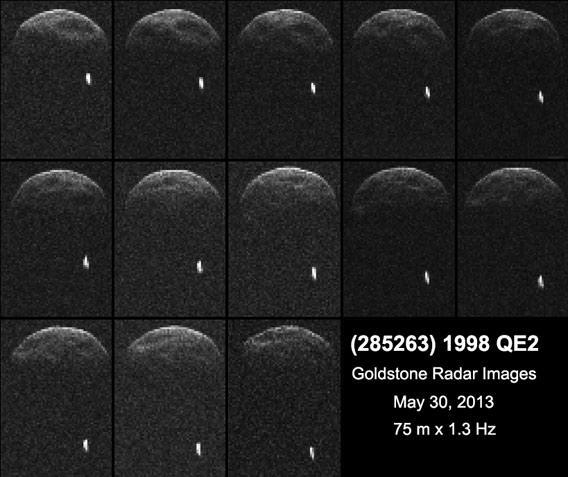 Radar observations of asteroid 1998 QE2 show it has a moon orbiting it. The asteroid pair is currently on a relatively near pass of Earth, sailing by us at a closest approach of just under 6 million kilometers (3.6 million miles) later Friday. Asteroids that get this close are of particular interest to astronomers, because that means we can use radio telescopes to bounce radar off them, which can lead to a better determination of their size, shape, speed, and position. From these data we now know that the main asteroid spins about once every fours hours at the most—previously it was thought to have a 5.3-hour spin. That old estimate was based on its light curve—that is, brightness variations as it spins. Imagine a dark ball with a single white spot on it. As it spins, you’d see it get brighter every time the white spot comes into view, and that can be used to peg its rotation. It’s not always 100 percent accurate, though, as it wasn’t in this case. There are several dark features on the asteroid that may be craters, but they might also be patches of material that absorb radar so they simply look darker. We should know better soon as more data come down.